On the other hand, my sister in Louisiana wrote back “Who are these people?” My sister, age 68, suffers from many health disorders including a childhood disability and neuropathy associated with the chemo she had for cancer a few years back. (Is the cure sometimes worse than the disease?) These days, she lives with one of her sons. The different responses remind me that aging is different for different people and that most of the time, the people involved with aging are women. The fact that my 83-year old husband is still in relatively good health is a miracle. David drank like a fish until he was 50 years of age. He would kill me if he knew I said it, but he is in great shape, for a man of his years. Yesterday, I was reminded of David’s health when I was scanning some of the hundreds of photos I took in Wisconsin over the years. 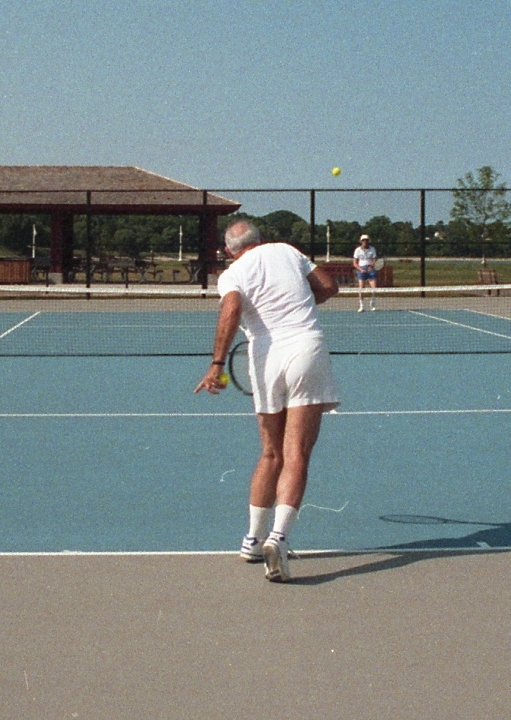 There is David in his white tennis togs, looking adorable. Meanwhile, I am getting fatter and fatter. I eat like a bird, he wolfs down whatever he wants. I have to work on my health every day of every hour. What a bore. 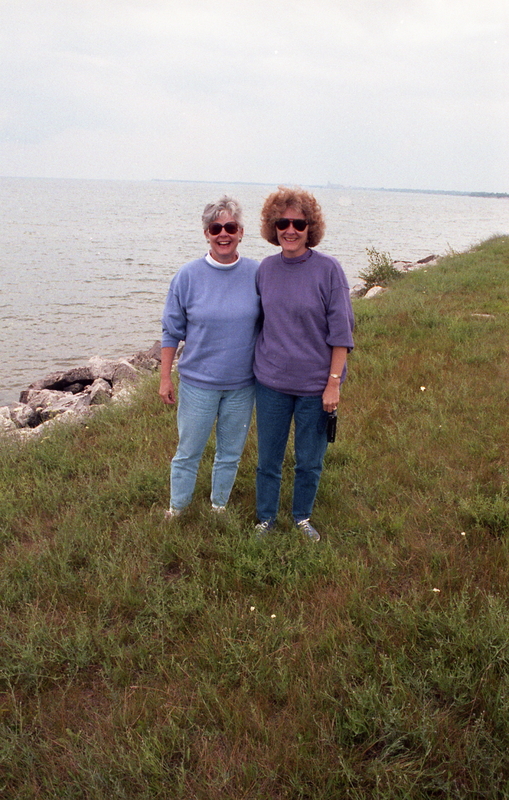 That’s me standing with my sister at the edge of Lake Michigan in Dorr County. These photos are about 10 years old. The really disgusting thing is that David is 12 years older than me and I don’t look like that slim now I have reached his age. 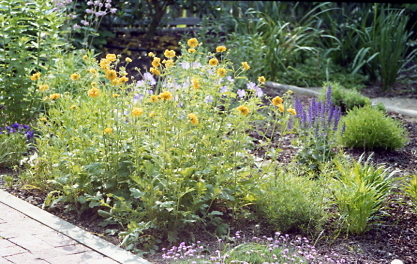 One of the things I have discovered as I have scanned all these old negatives, is that I once had a beautiful perennial garden. That was before the trees next door and next door (both sides of the yard) shaded all the perennials and they died. These days, I have been converting my beds to shade plants, which are not nearly as colorful. Below are some shots of my garden around the middle 1980s. I love a yellow and blue palette best. But I can’t get those colors today, except in my front border bed. Now days in the back beds, we grow Hosta Lillies, Helleborus, the tall variety of Solomon’s seal, shade loving ferns, Brunnera (blue perennial forget me nots), white-flowered Japanese Anemone, Creeping Woodruff and low shrubs like Skimmia. When Seth comes to work on the yard at the end of the month, He is to install 7 new female Skimmia shrubs. The birds are mad about the red berries. 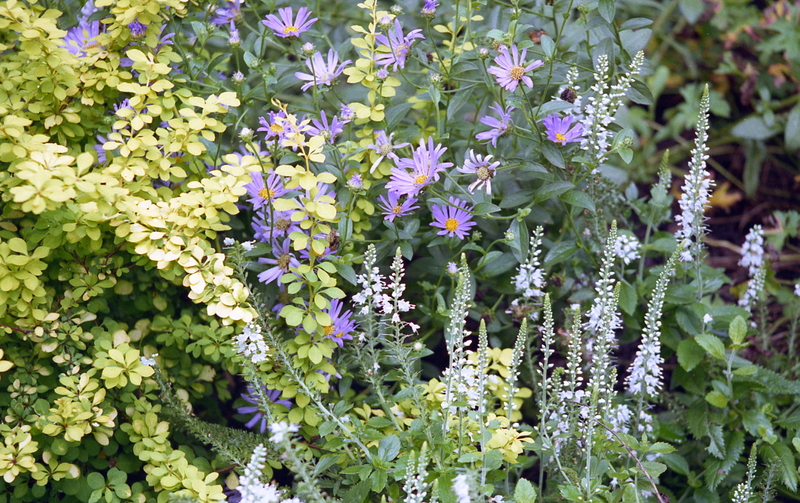 I can get lots of blue and white flowers in my spring beds, but the yellow flowers prefer the sun. Except for the daffodils. Yesterday, I ordered about 100 yellow and white daffodil bulbs of the miniature variety. 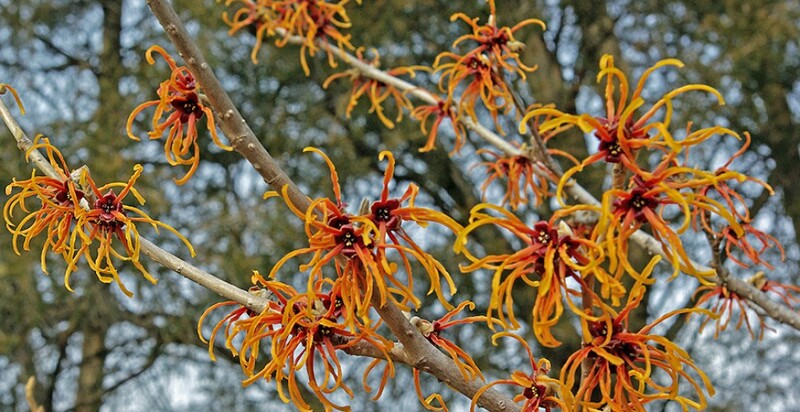 They will come up with the blue Scilla in the Spring before the walnut tree leafs out. This entry was posted in Birds, Elder Blogger, Family/Children, Gardening and Gardens, Health/Medical Stuff, Memories by SchmidleysScribblins. Bookmark the permalink. Funny how we miss stuff as we’re living it, and only discover it in old photos. I’m really enjoying your trip down memory lane. I don’t eat much chocolate at all, only the crap on the Weight Watchers desserts. Great that you’re sharing those photos with family — you can please some of the people …. you know how that goes. Amazing with as much alcohol intake as you describe that his brain isn’t pickled as some patients I’ve encountered. Good for him that he has such great metabolism — we just never know what our body thrives on or tolerates. I had a friend who could eat everything in sight and never gain an extra pound. I could just look at the food she was eating and the calories would leap into my body, congregate and immediately start forming fat cells. My husband was put on a steroid for several years which had quite a few effects, none the least of which was adding weight on his body he could never lose, so as you likely well know different meds can have a variety of different effects for individuals. Photos of your flowers are most attractive. I’m partial to blue, including in flowers. I have a covered shaded area outside my front door that never sees sun. Shade azaleas couldn’t survive, but not having time to fool with much more, I stuck in some geraniums I rooted from a few cuttings and they have thrived — lots of colorful blooms. My own opinion is that most of what makes us gain or lose is tied to genes, although Weight Watchers is working for me. Thanks for the compliment regarding the flowers. Mostly green now with shade plants. I grow colorful plants out front or in pots that get sun. One day scientists will discover a safe new drug that will give everyone a metabolism like David’s. And that will cause a major economic crisis with the demise of the pervasive weight-loss industry! I, too have a shady yard. My sunny spots will soon be devoted to fall veggies if I can get all my body parts to cooperate for preparation and planting. This summer I am just enjoying neighbors blooms and the accounts and photos of all you gardening bloggers. I think weight comes off the same way it came on, one day at a time. Lucky you able to grow veggies. I can’t any more. Does medication you take lead to weight gain? If so, there’s little you can do about it unless you change your meds. I love colorful vegetation, also, but not the bees. For this reason, I planted colorful crotons as a hedge. They get a lot of sun and are thriving. Doc says the meds are not causing weight gain. I attribute the weight gain to a propensity to eat too much of the wrong thing. Weight Watchers is helping me a lot. I love bees and butterflies too. Wasps are the problem when it comes to stings and Yellow Jackets are the worst. Bees generally don’t sting.